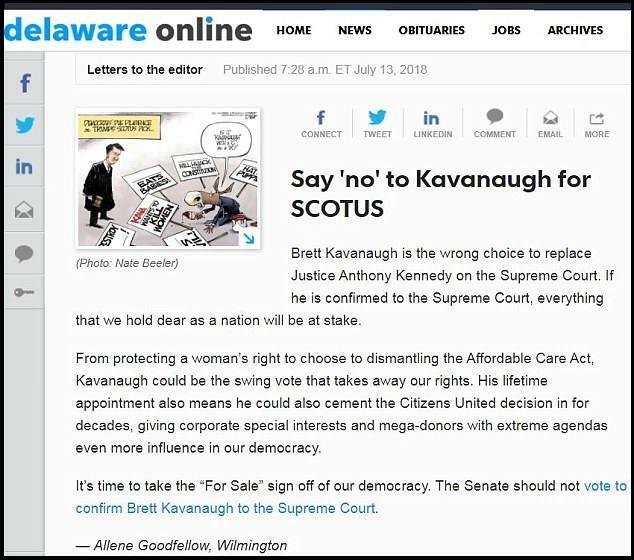 A series of identical letters signed by different individuals were sent to newspapers across the country in protest of President Trump's Monday nomination of Judge Brett Kavanaugh to the Supreme Court - a technique known as "astroturfing" designed to appear as a genuine grassroots effort against the pick. In total, 21 newspapers across 12 states printed the identical letters - each signed with a different name, as first noted by the website Liberty Headlines and further investigated by the Daily Mail's David Martosko. At least one person didn't even know her name was being used to sign the letter. 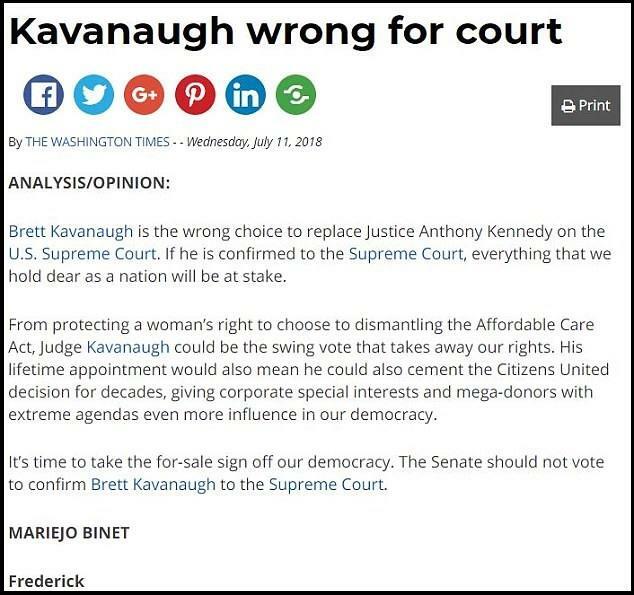 The letter begins with a declaration that "Brett Kavanaugh is the wrong choice to replace Justice Anthony Kennedy on the Supreme Court. If he is confirmed to the Supreme Court, everything that we hold dear as a nation will be at stake." It goes on to warn that there could be a swing-vote that "takes away our rights" while giving "mega-donors with extreme agendas even more influence in our democracy." 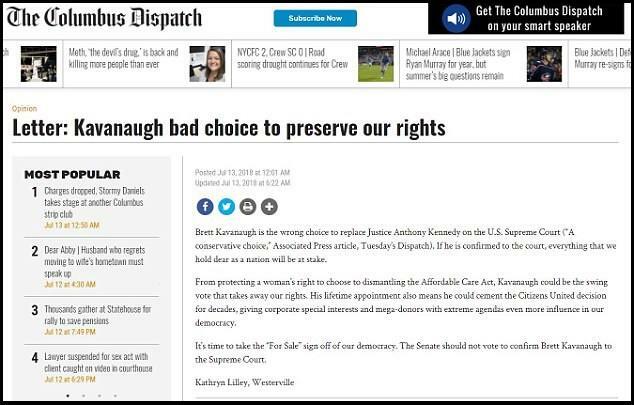 The Washington Times and Colombus Dispatch in Ohio both published the same letter - signed by two different people. White House Deputy Press Secretary Raj Shah shrugged off the letters when the Daily Mail reached out, writing in an email: "I suppose that’s a clever way to ensure message discipline,' he said, 'but we think most Americans will see through these tactics and be impressed with Judge Kavanaugh’s sterling record and qualifications." 'I got duped, which is embarrassing and frustrating,' said Lodge. Martosko notes that it is standard practice for opinion page editors to call the writers of the letters. He also points out that "astroturfing" - creating the illusion of popular support by littering newspaper opinion pages with fake letters is nothing new. In 2004 the liberal group MoveOn.org launched a website tool that generated editorial letters for its members promoting the Michael Moore film 'Fahrenheit 911.' All it required was a name, hometown and ZIP code. The USC Annenberg School for Communication and Journalism's Online Journalism Review reported that the Republican National Committee had the technique down a year earlier. Using a website called 'GOP Team Leader,' the party offered 'points'– redeemable for merchandise – when their letters were actually published. National Review Online contributing editor Quin Hillyer told the Daily Mail that the "rather transparent astro-turfing shows that the Leftist intensity against Kavanaugh is not naturally widespread, but instead is manufactured by paid agents." While it is unclear who exactly those organizations are, the usual suspects on the left have denied involvement - including DemandJustice, Protect Our Care, and MoveOn.org. 'While millions of MoveOn members oppose Brett Kavanaugh‘s nomination, the organization did not generate these letters to the editor,' the spokesman said Sunday after this story was first published. Large outlets that have run the letter since July 11 include The Washington Times (DC), the Boston Herald (MA), The Columbus Dispatch (OH), the Dallas Morning News (TX) and the San Antonio Express-News (TX). The Grand Junction Sentinel (CO) was a victim, along with The Wilmington News Journal (DE), the Coeur d'Alene Press (ID), The Forum (Fargo, ND) and the Beaumont Enterprise (TX) . Smaller newspapers that published the letter included the Santa Monica Daily Press (CA), The Union Democrat (Sonora, CA), the Daily News (Newburyport, MA), The Eagle-Tribune (North Andover, MA), the Daily Hampshire Gazette (Northampton, MA), The Times Herald-Record (Middletown, NY), the Daily Reflector (Greenville, NC), The Express Times (Easton, PA), the Republican Herald (Pottsville, PA), The Herald-Zeitung (Brownsville, TX) and the Martinsville Bulletin (VA).